Department Chair: Marianne Takamiya, Ph.D.
Astronomers seek answers to some of the biggest and oldest questions in science: How did the Universe begin? How will it end? What is in the Universe? How do stars, planets, galaxies and black holes form? How do they end? Addressing these questions incorporates physics, mathematics, chemistry, biology, computer science, optics and instrumentation, and even history and philosophy are companion fields. The UH Hilo academic astronomy program leverages the astronomy infrastructure of Mauna Kea and the University Park of Science and Technology to provide students with knowledge of astronomy and astrophysics, and training in modern methods of observational astronomy. The B.S. degree program provides the skills necessary for students seeking careers in astronomy, as professional research astronomers, observatory technical staff members, or work in related fields that include planetary geosciences, teaching, and outreach. The UH Hilo astronomy program aims to (a) develop the science knowledge and analytic skills of students, whether they be majors or not, through a focus on the field of astronomy; and (b) instill an appreciation of science, particularly astronomy, in students. The program provides the students with transferable skills so they can excel in a wide range of STEM-related fields. Through the study of astronomy, graduates will also learn to appreciate and understand science more broadly, enabling them to be more informed citizens. The B.S. 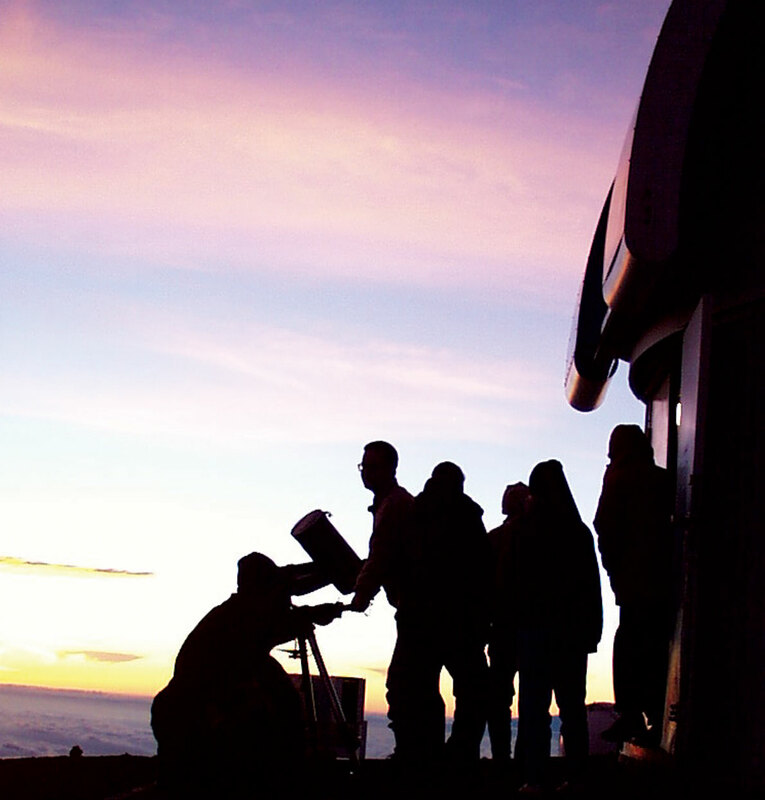 degree program, taking advantage of our access to Mauna Kea Observatories, provides the training needed for students seeking careers in astronomy--as professional astronomers, observatory technical staff, and educators. Our program supports the liberal arts mission of the University by providing general education courses in a field of major importance to the State of Hawaiʻi. Practical applications such as instrumentation, computation, modern observational techniques, and data analysis. appreciate the impact of astronomy in the state of Hawaiʻi. We also try to provide every opportunity for the students to conduct original research with faculty or Mauna Kea Observatories staff. The Department is housed in the new Sciences and Technology Building, which provides modern offices, classrooms, introductory and advanced undergraduate labs, and faculty research facilities that offer students an ideal working environment. The Department owns an observatory site on Mauna Kea among some of the largest and most powerful instruments in the world. A planned new telescope will provide students with the opportunity to pursue research-grade projects under the supervision of Department faculty, who have active research projects in several areas of astronomy. In addition, the Observatory Internship program, coordinated with institutions based in the University Park of Science and Technology, offers students a unique opportunity to gain practical or research experience at astronomical observatories atop Mauna Kea prior to obtaining their degree. The Space Grant Fellowship Program offers competitive fellowships to students of exceptional promise, usually during their senior year. The fellowships provide a full tuition waiver and a small stipend. Space Grant Fellows conduct a proposed research project under the supervision of a faculty mentor and participate in University-wide Space Grant College symposia. Funding for travel to meetings is available from this program. Affiliated faculty from the University Technology Park and other facilities offer a rich array of supplemental Special Topics courses which expand opportunities for students. Students view the sky atop Mauna Kea using a portable telescope. Last updated on Thursday, June 14, 2018, 2:30pm HST.